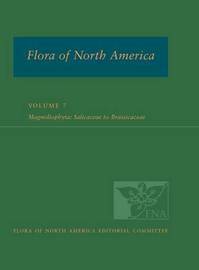 Flora of North America Volume 7 will be the eighth of 19 volumes on dicotyledons to be published in the Flora of North America North of Mexico series. It treats 923 species classified among 125 genera in 11 families; the larger families covered in Volume 7 include Brassicaceae (Mustard family), Cleomaceae (Spiderflower family), and Salicaceae (Willow family). The endemic family Limnanthaceae with eight species classified in two genera (Floerkea and Limnanthes) is also included in the volume. Each genus has representative species illustrated with a line drawing that, in combination with keys and descriptions, will facilitate identifications of these groups of plants. Some of the genera treated in this volume with the most species in the flora area include: Boechera, Cardamine, Draba, Lepidium, Physaria, and Streptanthus (Brassicaceae) with 109, 39, 121, 42, 88, and 35 species, respectively; plus Salix and Populus (Salicaceae) with 113 and 8 species, respectively. Three families are represented in the flora each with a single introduced species: Caricaceae (Papaya family), Moringaceae (Drumstick tree family), and Tropaeolaceae (Nasturtium family).Standing OrdersTo receive all Flora of North America titles automatically as they are published, and at a 25% discount, please submit your request for a standing order (ISBN 978-0-19-521735-3) to custserv.us@oup.com.